Smart Technologies has announced the Smart Slate WS200, a device that allows teachers and students to annotate onto the main screen from anywhere in the room. The portable Smart Slate weighs just 21 ounces and measures 10.5" x 8.5" x 1" and can be used for annotating lessons projected on a screen, an interactive whiteboard, an interactive display, or an interactive pen display. The wireless Smart Slate uses Bluetooth 2.1 technology to communicate with the display. Each point on the Smart Slate's 6.8" x 4.26" active pen area corresponds to a point on a connected computer display. 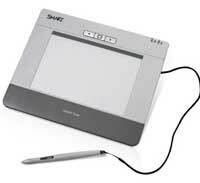 The Smart Slate can be used to control on-screen learning applications, write and draw in digital ink, or open and view files on a connected computer or on a Smart Board interactive whiteboard. The WS200 supports 10 languages, including English (United States and UK), Brazilian Portuguese, Simplified Chinese, French, German, Mexican Spanish, Russian, Arabic, and Castilian (European) Spanish. This product is a replacement to Smart's AirLiner WS100 wireless slate. The Smart Slate wireless slate runs $349.